Group Affiliation: Ally of the Abominations and the Forgotten; Formerly partner of the Rhino, crew of the starship Andromeda, agent of the Galaxy Master, and MODOK. Enhanced Abilities: The Abomination’s strength, endurance and durability have all been enhanced to levels only matched by the Hulk. Body Armour: The Abomination’s scaly skin provides him with almost total protection from physical and energy attacks. He is also unaffected by heat, cold, fire and disease. Leaping: The Abomination has overly developed leg muscles which allow him to leap over 2 miles with a single bound. Healing: The Abomination has regenerative abilities that allow him to recover from massive cellular damage. Resistances: The Abomination has a high degree of resistance to extreme’s of cold and heat. Suspended Animation: Extreme pain, cold, or extended lack of oxygen can cause the Abomination to enter a coma-like state of suspended animation, in which he can survive, perhaps indefinitely. Emil Blonsky became the Abomination by the same process which turned Bruce Banner into the Hulk. Blonsky was a Yugoslavian spy known as. A man who fought for his country and their ideals, Emil was a married man who held a somewhat unstable relationship with Nadia Blonsky. Even though Emil cherished his talented wife with her stage dancing, their marriage held rough edges when Emil occasionally resulted to hitting his wife in a state of rage. After being given a specific mission to travel to the United States and infiltrate one of their military bases to sabotage all nuclear warheads, missiles, and any other equipment that would give the U.S the upper hand for a possible upcoming war, Emil enjoyed one last supper with Nadia before leaving with the promise of returning to Nadia. After managing to enter the US with a partner known as Bogatin and infiltrate an Air Force Base within New Mexico while taking the disguise of an MP, Blonsky also found himself stumbling onto the same base where Dr Bruce Banner (Hulk) usually conducts his gamma radiation experiments. Even though Blonsky was designated to fulfil his primary mission, this plan changed when the alien entity known as the Stranger made the attempt of using the Hulk as a means to destroy humanity after deeming humanity irresponsible. When Hulk reverted back into Banner, because of how the Stranger had no control over Banner, he attempted to prevent the Stranger’s goal on controlling the Hulk by committing suicide. Banner tried to go about doing this by using a machine that would bombard Banner with enough gamma radiation to where it would kill both him and the Hulk, also unaware that Blonsky was hidden within the room and secretly recording Banner’s actions. But before using the machine, Banner was escorted from the laboratory by security and General Ross, leaving Blonsky alone with the radiation machine. Because of curiosity, Blonsky who was unaware of the machines design and nature, stood in front of the machine before activating it. 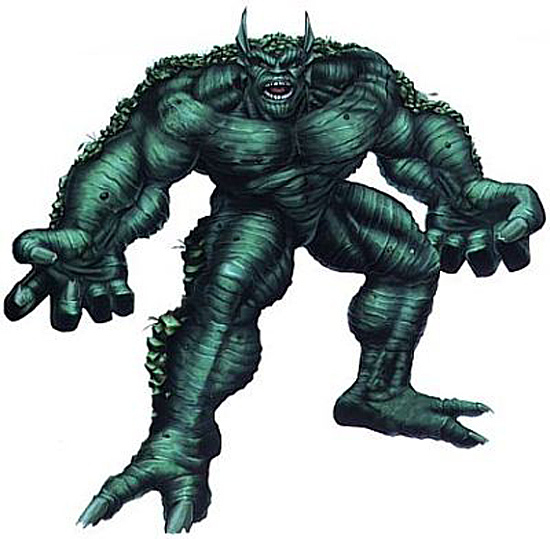 Being bombarded with great amounts of gamma radiation, Blonsky went through a mutagenic effect that rapidly transformed him into a massive and hideous looking monster.